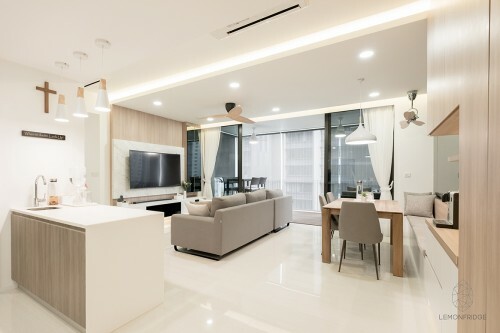 " Designer was very responsive and understands very well"
"It was a fulfilling renovation"
LemonFridge Studio comprises a team of young and dedicated designers working in tandem, specializing in interior and spatial design. We aim to unsheathe the best of both worlds in our projects: functionality and aesthetics. The design will be ergonomically sound, sophisticated and shall most importantly reflect and realize the client’s impression of ideals and needs. We pride ourselves in our ability to conceptualize unique designs as we believe that homes should reflect the dweller’s personality, and no two persons are the same. Our designers are professionally trained and experienced in a myriad of styles, regardless in residential or retail settings. We provide interior design and renovation services, consultation with us ensures top-notch quality from project planning to design delivery and aftercare services. With our combined experience and knowledge, we are confident in our ability to advice with modern and new-fangled solutions, establishing a reputation for quality in all our projects.